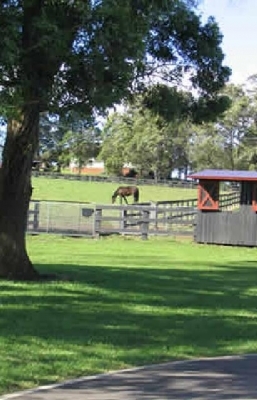 Copabella in Arcadia, 15 pasture-improved acres. Less than an hour northwest of Sydney's CBD, this boutique boarding establishment provides full service and training for resident horses and their owners. The property has been purpose-built for intensive, high-quality horse care and management. Paddocks are post-and-rail fenced, pasture-improved, irrigated and well-maintained. All have automatic drinkers. Improvements include state-of-the-art brick stabling for 12 horses, and large overnight yards with shelters for several more. There is an all-weather sand/fibre dressage with floodlights for night riding, a huge sanded-and-grassed jumping arena and a large roundyard for lungeing and starting young horses. Boarders share a fully finished tack room with personal tack closets, kitchen, bathroom, laundry and float parking provided.